Jumping on a square trampoline is fun and a great way to stay healthy and fit. Buying a trampoline is a big purchase for the family and it is important to make certain that you get the right one for your family’s needs. Now, there are many different options and types of trampolines available. They also come in many different shapes too. You no longer have to settle for the traditional spring type, as springless models are now available. In this guide we'll help you find the best square trampoline for sale. Is The Skywalter Square Trampoline Right For You? Is The Springfree Square Trampoline Right For You? Of course, safety is the most important feature and having a strong safety net is essential. If you want a trampoline, square is our choice. Trampolines come in traditional round, oval, rectangular, and square. Square trampolines have many benefits over the traditional round ones that are commonly a favorite for home use. They tend to provide a bounce that is firmer, but that has less jumping height. This can be a great choice for adults who do not want to fly as high as younger users. 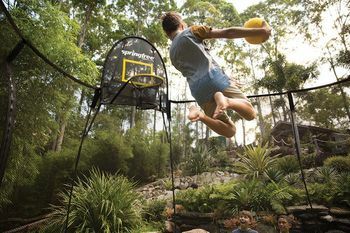 It also means that the jumper has to work harder, which makes square trampolines a great choice for those who want to use it for health and fitness. Size is important when it comes to choosing a square trampoline. 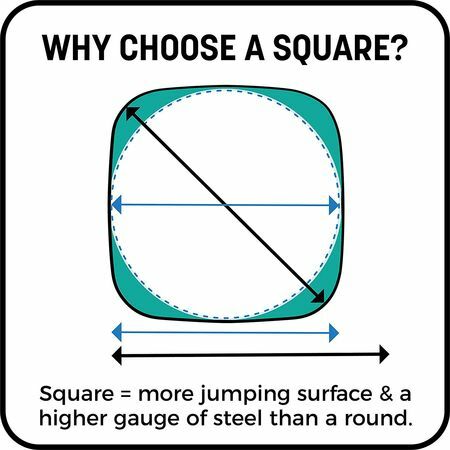 Square trampolines are often lighter weight and smaller than rectangular ones. 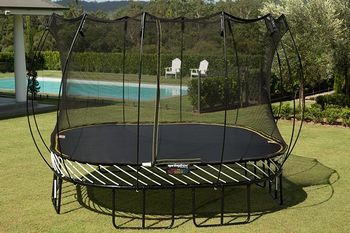 Unlike the round trampoline, which only has bounce near the center, the entire surface of a square trampoline offers excellent jumping opportunities. Spring free trampolines are a top pick for safety because there is no chance of getting your feet caught in the springs and suffering injury to the ankle or foot. When it comes to choosing the right size of trampoline, bigger is not always better. A bigger trampoline offers more jumping area, but they are often less bouncy than smaller ones. This is an important consideration if you will have more than one person jumping on it at one time. Now let’s examine two of the top square trampolines for sale. So now that you know why you should consider buying a square trampoline, if you are in the market for a trampoline, we can look at some of the great options out there. The Skywal﻿﻿ker 15 square trampoline is one of the best square trampolines on the market for many reasons. The first is that this big square trampoline offers a lot of jumping area. One of the best features of this model is that the net interlocks directly to the jumping mat, which creates a jumping area that is free of gaps that can trap your feet. It has a reinforced T-socket construction that prevents the enclosure frame from twisting. This eliminates a potential safety hazard. The frame is made of 16-gauge, 2.4 inch diameter galvanized steel. This makes it strong and rust resistant. The Skywalker square trampoline provides an extra long area for jumping. The trampoline is rated for ages six and over and can handle a 250 pound weight capacity. Skywalker is a popular brand because of their safety record. Families can enjoy the jumping experience without having to worry about the trampoline causing injury. 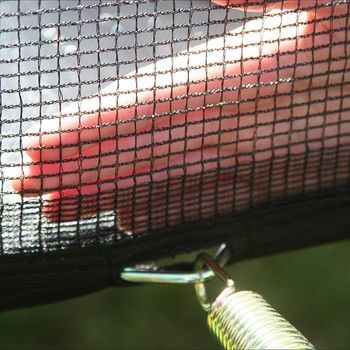 The trampoline comes with a 90 day warranty that covers the netting, pad, plastic hardware, and jump mat. The frame and springs have a one year warranty. 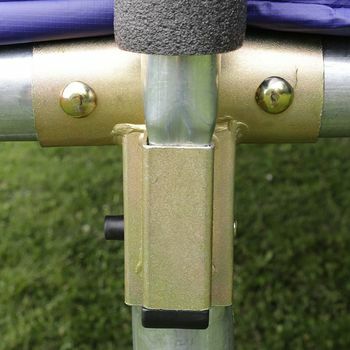 Skywalker trampolines meet all ASTM safety standards. This is why the Skywalker brand is a name that is trusted by parents and coaches. The Skywalker square trampoline has a harder bounce, as compared to a round trampoline that has a softer bounce. This means that the jumper can gain more lift, leading to much more high-flying fun. This model is a traditional spring type trampoline. In order to resolve the issue of exposed springs, a 1 inch thick foam padding is offered as a cover for the springs. The pad is UV resistant and will not break down in the sunlight. The netting enclosure is high quality polyethylene, which also increases UV protection and the durability of the materials. The shipping weight is 108 pounds. This model is only available in the United States. The Skywalker square trampoline is recommended for those involved in competitive jumping or gymnastics training. Those that are serious about jumping will love this trampoline because of its bounce. This is one of the lower-priced trampolines considering the professional performance that it provides. The bounce is comparable to trampolines that are built for professional use. This is great for someone who needs to practice for competitive gymnastics or other sports. This is one of the features that people who purchased it loved about it. One of the cons of this trampoline is that because it has so much bounce, it has a few safety concerns. This needs to be taken into consideration if the trampoline will be used for small children, inexperienced jumpers, or those with other safety considerations. Without the mat to protect the springs, there are some safety concerns about injury to the feet and ankles. Is recommended that the mat always be used to cover the springs. Another con of this trampoline is that it does not fold up for storage in a garage or other building. This may be an issue when storing it long-term, such as during the winter months. It could be disassembled for storage and then reassembled in the spring, but this is not very convenient for most. It is possible to cover the trampoline frame for the winter, but this risks damage to the components. Each time the trampoline is reassembled or opened for use, an inspection must be performed on all pieces to make certain that they are still sturdy. This was one of the main drawbacks that purchasers found with this model. 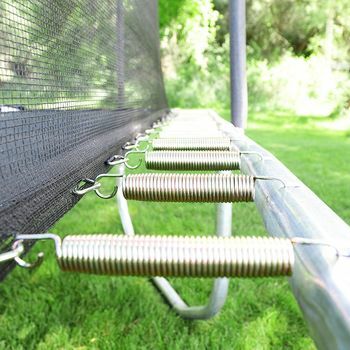 The Springfree 11ft is another great choice for a square trampoline. They have many years of experience in manufacturing spring free trampolines. The spring free system was the invention of Dr. Keith Alexander, who worked on the design for 15 years to make certain that he had it right. 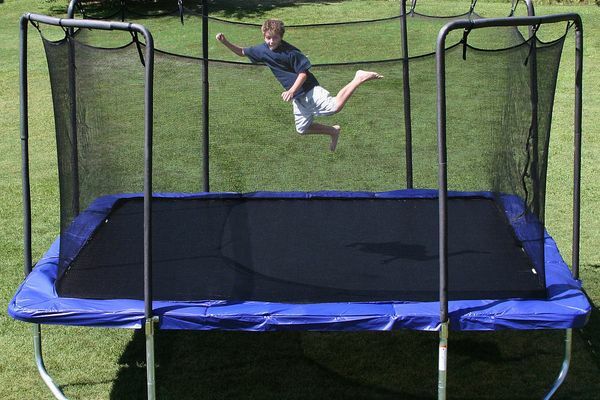 The first spring free trampoline was produced in 2003. As the name implies, it does not use springs, which makes it a favorite for those who are concerned about safety. They also offer one of the longest warranties of any trampoline manufacturer. The frame is covered for 4 years or 8 years depending on whether you choose to register your purchase or not. The mat, rods, and net can be warrantied for one year, or two years if you register them. They are also known for their excellent customer support team. This innovative design earned an award for being Product of the Year in 2010 in both the United States and in Canada. It earned a Good Design Award in Australia in 2016. This trampoline manufacturer has also earned other awards around the world and is a favorite choice by parents. This trampoline gives parents peace of mind due to its top safety rating. You might be wondering how a spring free trampling works. Rather than using springs, the bounce is delivered by angled fiberglass rods that create a coiling action to produce the bounce. This produces a much softer bounce than traditional spring style trampolines. This trampoline is a little pricier, but it comes with a Tgoma Digital Game System, FlexHoop basketball hoop, and a FlexStep ladder. The manufacturers claim that this trampoline can be left outside all year long because it is made of double powder coated galvanized steel and UV resistant polyethylene nets and mats. The composite fiberglass rods will also not break down cold weather. Even though the manufacturer says that it can can be left outside, it is important to check all structural components before allowing the children to jump on it the following spring. 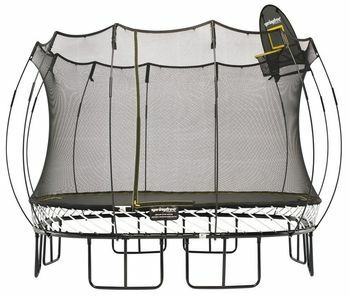 The Springfree trampoline is rated as having a nice compromise between bounciness and softness. Reviewers consider it to be somewhere between the bounciness of a rectangular trampoline and a round one. It also has a flexible response enclosure and a durable design to the base. The best part about this trampoline is that there is no chance of jumpers coming in contact with springs. The absence of springs also increases the jumping area. The absence of springs eliminates 90% of the most common trampoline jumping injuries. This trampoline was designed for maximum weight of 250 pounds. The Springfree square trampoline is one of the more expensive trampoline models on the market, and it is designed for home use, rather than professional or semi-professional bouncing. It is considered to be a home model and best suited for general purpose jumping. Another con of this trampoline is that it weighs 269 pounds when shipped. It also ships in three separate boxes that measure 134 x 134 x 110 inches. This is a little bit large and difficult for most people to handle by themselves. The springless construction can also be cumbersome for those that are not experienced with these types of product assembly. However, the product comes with videos that help explain the assembly in a way that most people can understand. The Springfree 11ft is a top pick for safety because it has no springs and no hard edges. 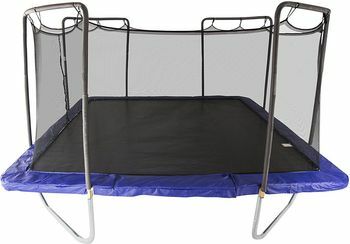 The trampoline is constructed so that the frame is located beneath the jumping surface. The jumper will not come in contact with the fiberglass rods. This trampoline gives parents peace of mind that their kids are safe while enjoying jumping. The game system is fun for both kids and adults. This gets everyone involved in jumping for their fitness and health. This is an innovative design that is quite an improvement over the spring type trampoline. However, it is designed for home use, and may not have enough bounce and lift for those that wish to practice gymnastics or other athletic-type jumping. Now you have it, our favorite models by our two favorite trampoline manufacturers. Skywalker is the leader in spring type trampolines and offers enough bounce for professional gymnasts to practice. This would be our choice we were choosing a trampoline that is intended for athletic training for the serious jumper. It is also a great low cost choice for the family. Springfree is another favorite top pick because they offer innovative design with a focus on safety. This would be our top choice if one were choosing a trampoline for small children who just want to have a little bit of backyard fun. The durability of the Springfree trampoline means that even though it is a little more expensive, it will last for many years as your children grow. When it comes to choosing a trampoline, it is important to consider the type of jumping that will be done on it. The question is whether you need performance in terms of bounce, or whether your first concern is safety. When choosing it square trampoline, it is important to consider your needs for the future. Both of these choices are excellent, depending on which features you consider to be the most important for your families’ circumstances.